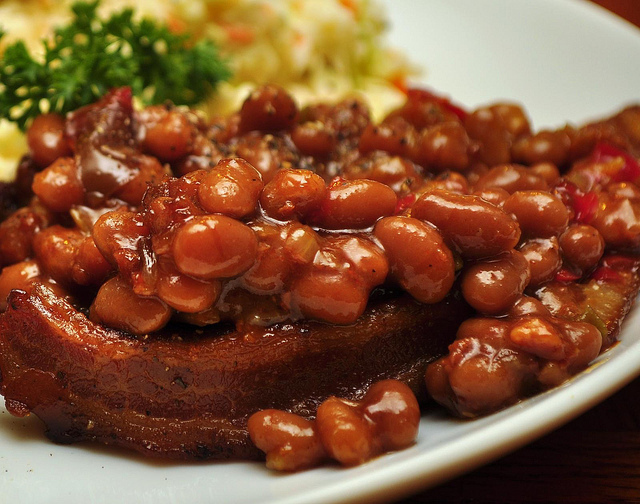 I've been making these beans for my family for 30+ years and they are always a hit. Now that we are empty nesters, I make a big pot of these and then freeze them in 2 cup containers for a quick and yummy addition to any meal. I put the following ingredients (which are always in my pantry) into the crockpot before I go to bed and let them cook on LOW all night. 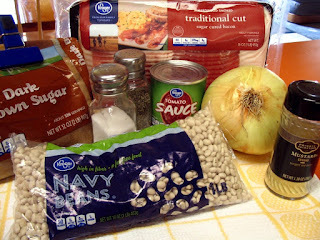 Now, a word about the beans: Over the years, I've tried every kind of DRY bean there is and they ALL work, however, the tiny little "navy beans" work the best and tolerate re-heating without going mushy. I highly recommend that you use navy beans. Saute onions and fry bacon until almost crisp then drain well. Put everything into a large crockpot and cover with 6 cups of water. Stir well and set on low for 12 hours. At the end of 12 hours, if it seems like there is too much liquid in the beans, you can prop a spoon under one side of the crockpot lid and let the sauce cook down for a couple hours. I seldom have to do this, but it HAS happened with certain types of beans. Note about onions: When I decide to make these beans and I'm out of fresh onions, I use a scant tablespoon of dehydrated onion flakes, they work well.